Chinese media described the recent purge of former top general, Xu Caihou as an “earthquake” in the nation’s military. The shaking in the armed forces has likely not stopped, as signs point to another former top military official being targeted, as Party leader Xi Jinping seeks to assure his control. In the current purge of the Chinese Communist Party by leader Xi Jinping, overseas media outlets—particularly those in Taiwan and Hong Kong, and dissident media—have often acted like a canary in the coalmine, quickly picking up on the signs that a new high-level official is going to be taken down. This pattern has held since the Bo Xilai scandal in 2012, and was mostly recently manifest in the removal of former vice chairman of the Central Military Commission (CMC) Xu Caihou, who observers say had to go, as a demonstration that Xi Jinping was taking charge from the old guard. Now, the longtime colleague and confidant of Gen. Xu, Gen. Guo Boxiong, is also said to be headed for trouble. Leaks and reports about Guo Boxiong, a former top military commander, and a vice chairman of the Central Military Commission from 2002 to 2012, have been rattling around the Chinese Internet for the last several months. Boxun, an overseas Chinese website that regularly carries political news and rumor, reported in April that Guo had already been thrown in prison. Duowei, an overseas Chinese outlet whose uncanniness in noting the shifts of political winds has led many to suspect that it is being used as a mouthpiece by the Xi Jinping regime, reported that Guo’s prospects were “not too encouraging,” and that his disciplinary problems were “equally as grave” as those of Xu Caihou. Recent personnel changes at the top in Guo’s old stomping ground, the Lanzhou Military Region, where a potential Xi loyalist was made political commissar, have also suggested that the top Party leadership may have a plan for Guo—given that a similar personnel shift preceded the purge of Xu Caihou. As vice chair of the CMC, Guo was the equal second military commander in China: both he and Xu Caihou sat under Hu Jintao, then-Party leader, as top officials of the armed forces. Like Xu, Guo was brought into the CMC by outgoing Jiang Zemin, the leader of the Chinese Communist Party from 1989 to 2002, and commander of the military forces until 2004. Just as Jiang had planted his people at the top levels of the Party apparatus, the Politburo Standing Committee, so he stacked the top military committee. “Xu and Guo were Jiang Zemin’s top two military lieutenants, and they were the pawns he put in place to keep a watchful gaze over Hu Jintao,” wrote the Chinese commentator Chen Pokong in a recent article. In this analysis, the two generals divided their duties, with Gen. Guo overseeing staffing and equipment, while Gen. Xu saw to political training and logistics. In their roles, the two vice-chairs had opportunities to accumulate vast wealth. In May the Hong Kong magazine “Front Line” (Qianshao in Chinese) published an article alleging eye-popping corruption related to Guo Boxiong, Xu Caihou, and others. Analysts of Chinese communist politics generally understand articles like this to be a combination of genuine political leaks and creative writing on the part of the journalists that report them. The journalists fill in the details not provided by the source, livening up otherwise dull political reportage for the man-in-the-street reader. Gu Junshan, a top military officer who was the first to be taken down in the current military purge, for example, was said to have delivered to Xu Caihou 12 Audi cars full of gold bars. Both Xu and Guo thought Gu sometimes took things too far, the article said. But when the corruption investigation came, they still acted fiercely to protect Gu from being purged, because their misdeeds were so inseparable from his. The article also discusses Xi Jinping’s reaction when finding out about the extent of the corruption perpetrated by Xu Caihou, Guo Boxiong, and another officer, Liang Guanglie. “Even though Xi Jinping was psychologically prepared for it, when he heard the details of these corruption cases he turned pale from shock,” the report said. Often, claims that a certain official is going to encounter trouble are difficult to verify in an empirical way—but sometimes there is a simple test: how often the official turns up in public. The examination of who attends meetings and who doesn’t has a long pedigree among China watchers, who are forced to adopt some of the tools of the old Kremlinologists—the dogged observers of the Soviet Communist Party, who would guess which official might be next in line for a political purge. Using this simple metric, Gen. Guo Boxiong would appear to be in a dubious position. The search function on the website of “Seeking Truth,” one of the Chinese Communist Party’s top theoretical journals, is widely recognized as one of the most robust ways to gather information from the Party’s own official publications, like the Xinhua News Agency and People’s Daily, the official newspaper. But if the pattern of coverage for Gen. Guo is anything like that for Gen. Xu, he could soon be in the news again. If he is taken down in a purge, the reports will come in a stream and be altogether dourer. “The Image of the Military Must not be Sullied,” said one headline after Xu’s takedown. Leaders of the Chinese Communist Party have always sought to ensure their control over the military forces, where the ultimate power resides. Mao Zedong was notorious for his paranoia and purging of top defense officials, and Deng Xiaoping, who followed him, also sidelined those in the armed forces that he came to see as rivals. Jiang Zemin, appointed by Deng, is widely thought to have gained the allegiance of the military by allowing vast levels of corruption. Jiang was forced to resort to this exchange to win loyalty because he lacked the personal authority and revolutionary credentials of Mao or Deng. 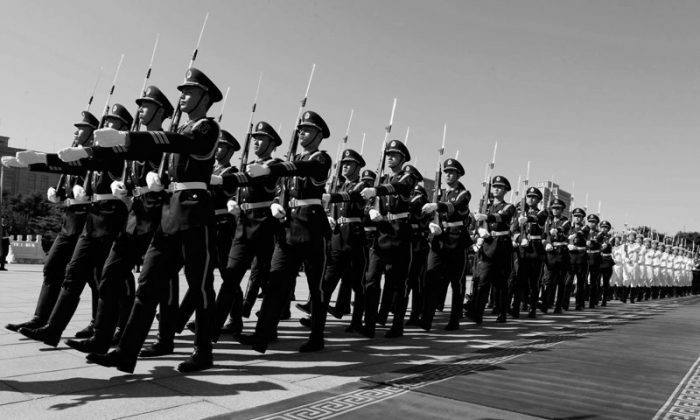 Jiang’s influence over the military, however, overshadowed many years of the Hu Jintao regime, which ran from 2002 to 2012. Jiang stepped down from head of the Communist Party in 2002, but retained his seat as head of the Communist Party’s Central Military Commission until 2004, and that of head of the state CMC until 2005. He also appointed key personnel to the Party’s CMC. Xi Jinping is now dealing with that legacy by purging top military commanders like Xu Caihou and, it is believed, Guo Boxiong. The former vice-chair of the commission that runs China’s military gained power by persecuting Falun Gong.